Ethernet refers to the family of Local Area Network (LAN) implementation. Ethernet is actually the most popular Local Area Network architecture that consists of Ethernet specifications and standards as well as Ethernet hardware devices such as Ethernet splitter, Ethernet drivers and USB Ethernet device. Ethernet and IEEE 802.3: LAN specification that operate at 10 Mbps over coaxial Ethernet cable. 100-Mbps Ethernet: A single LAN specification, also known as Fast Ethernet that operates at 100 Mbps over twisted pair Ethernet cable. 1000-Mbps Ethernet: A single LAN specification, also known as Gigabit Ethernet that operates at 1000 Mbps (1 Gbps) over fiber and twisted pair Ethernet cables. Ethernet has survived as an essential media technology because of its tremendous flexibility and its relative simplicity to implement and standard. Although other technologies have been touted as likely replacements, network managers have turned to Ethernet and its derivatives as effective solutions for a range of campus implementation requirements. To resolve Ethernet’s limitations, innovators (and standards bodies) have created progressively larger Ethernet pipes. Critics might dismiss Ethernet as a technology that cannot scale, but its underlying transmission scheme continues to be one of the principal means of transporting data for contemporary campus application. Ethernet is a baseband LAN specification invented by Xerox corporation operates at 10 Mbps using career sense multiple access collusion detect (CSMA/CD) to run over coaxial cable. 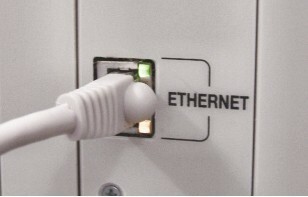 Ethernet was created by Xerox in the 1970s, but the term is now often used to refer to all CSMA/CD LANs. Ethernet was designed to serve in network with sporadic, occasionally heavy traffic requirements, and the IEEE 802.3 specification was developed in 1980 based on the original Ethernet technology. Ethernet version 2.0 was jointly developed by Digital Equipment Corporation, Intel Corporation and Xerox Corporation. It is compatible with IEEE 802.3. Ethernet and IEEE 802.3 are usually implemented in either an interface card on a primary circuit board. Ethernet cabling conventions specify the use of a transceiver to attach a cable to the physical network medium. The transceiver performs many of the physical layer functions, including collusion detection. The transceiver cable connects end stations to a transceiver. Ethernet provides services corresponding to Layer 1 and Layer 2 of the OSI reference model. IEEE 802.3 provides for a verity of cabling options, one of which is a specification referred to as 10Base5. This specification is the closest to Ethernet. The connecting cable is referred to as an Attachment Unit Interface (AUI), and the network attachment device is called a Media Attachment Unit (MAU), instead of a transceiver. In Ethernet broadcast-based environment, all stations see all frames placed on the network. Following any transmission, each station must examine every frame to determine whether that station is a destination. Frames identified as intended for a given station are passed to a higher-layer protocol. Under the Ethernet CSMA/CD media-access process, any station on a CSMA/CD LAN can access the network at any time. Before sending data, CSMA/CD stations listen for traffic on the network. A station waiting to send data waits until it detects no traffic before it transmits. As a contention-based environment Ethernet allows any station on the network to transmit whenever the network is quite. Collusion occurs when to stations listen for traffic, hear none, and then transmit simultaneously. In this situation, both transmissions are damaged, and the station must retransmit at some later time. Back-off algorithms determine when the colliding stations should retransmit. Gigabit Ethernet is an extent ion of the IEEE 802.3 Ethernet standard. Gigabit Ethernet builds on the Ethernet protocol but increases speed tenfold over Fast Ethernet, to 1000 Mbps, or 1 Gbps. This MAC and PHY standard is promises to be a dominant player in high-speed LAN backbones and server connectivity. Because Gigabit Ethernet significantly leverages on Ethernet, network managers will be able to leverage their existing knowledge base to manage and maintain Gigabit Ethernet networks. Several means can be used to deploy Gigabit Ethernet to increase bandwidth and capacity with in the network. First, Gigabit Ethernet can be used to improve Layer 2 performance. Here, the through put of Gigabit Ethernet is used to eliminate Layer 2 bottlenecks. Bandwidth requirements with in the network core and between the network core and the wiring closet have placed significant demands on the networks. Fast EtherChannel allows multiple fast Ethernet ports to be bundled together and seen logically by the Ethernet switches as a fat pipe. Fast EtherChannel allows the bundling of up to four ports, for an aggregate bandwidth of 800 Mbps. With support from Ethernet card manufacturers such as Sun Microsystems, Intel, SGI, Compaq, and Adaptec, Fast EtherChannel can now be provided directly to high-end file servers. Many large-scale networks use a meshed core of routers to form a redundant network backbone. This backbone typically consists of FDDI, ATM or Fast Ethernet. However, as newer network designs heavily utilized switching with 100-Mbps links to theses routers, a potential design bottleneck can be created. Although this is not county a problem, the migration of services away from the workgroup and to word the enterprise can potentially lead to slower network performance. The solution demonstrated by using Gigabit Ethernet switches that provide aggregation between routers in a routed backbone. Gigabit Ethernet and Gigabit switching are used to improve speed and capacity between the routers. Gigabit Ethernet switch is placed between the routers for improved throughput performance. You can also use industrial Ethernet router for that purpose. By implementing this design, a fast Layer 2 aggregation is utilized, creating a high-speed core. A switch is something that is used to turn various electronic devices on or off. 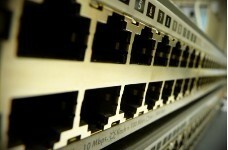 However, in computer networking, a switch is used to connect multiple computers with each other. Since it is an external device it becomes part of the hardware peripherals used in the operation of a computer system. This connection is done within an existing Local Area network (LAN) only and is identical to an Ethernet hub in terms of appearance except with more intelligence. These switches not only receive data packets, but also have the ability to inspect them before passing them on to the next computer. That is, they can figure out the source, the contents of the data, and identify the destination as well. As a result of this uniqueness, it sends the data to the relevant connected system only, thereby using less bandwidth at high performance rates. The wires in a crossover cable are “crossed” so that output signals from the transmitting device are properly sent as input signals to the receiving end. An Ethernet switch can be thought of as a device that makes temporary crossover cable connections between computers that want to communicate. Just like crossover cables, switches do not suffer from collision problems. However, it should be noted that the actual cables used are “straight through.” The crossover function is done inside of the switch. Since separate wires are used for sending and receiving, switches support operation in full duplex mode. This mode allows devices to send and receive data at the same time. As mentioned above, switches are intelligent devices that can read the data packets that pass through them. By storing each host’s MAC address and its corresponding port in a table, switches ensure that bandwidth is not wasted by intelligently directing traffic. Hubs are dumb devices that do not do any processing. Unlike hubs, switches are modern, fast, and support full duplex operation. In short, they are much better. More Resources: LAN, How to Set Up LAN Network?